Do you ever get an email with a few rows with some numbers beside them and you think for a brief second, why didn't they just make that into a chart? This happened to me recently and without hesitation I quickly copied the 14 rows and dropped it into Excel, connected Tableau to it, and off I went. Kim, a woman at my office, makes a ridiculous amount of cookies each year around the holidays. 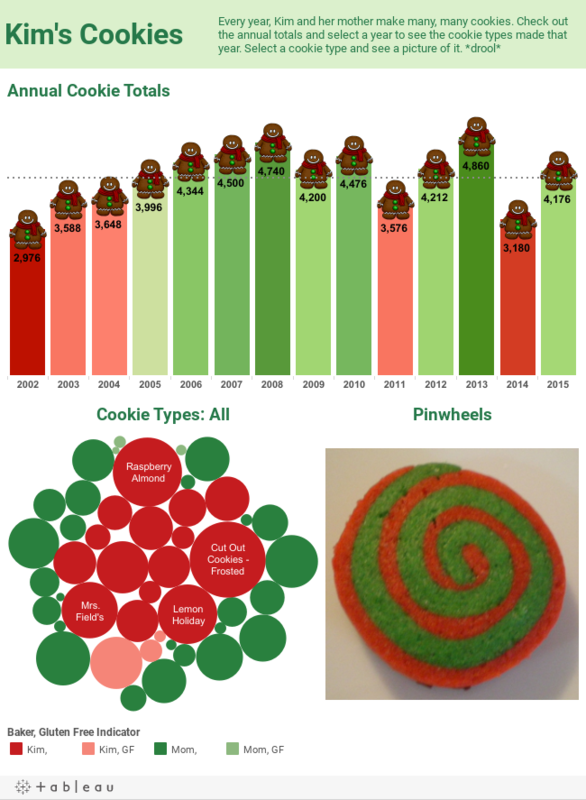 It started as a simple bar chart with some gingerbread men sitting atop each bar, representing the number of cookies made over the years. Kim appreciated my chart, shared it with her mother who helps in the baking, and offered me cookies in return for my efforts. When I stopped by her desk to retrieve my prize, she showed me a document she uses to track the types of cookies they make. Her document is used to track potential recipe improvements, but I saw the potential and asked her to send me the document along with the pictures of each cookie she mentioned she had. Here is the result of her efforts and a few minutes of my time.